CAN'T REACH ME? I am often over-booked, and thus not always available to address your wildlife issue. If I can't be reached, you can find alternatives at the WA Wildlife Removal Directory, although I cannot personally vouch for their services. Do your own research and hire who you feel comfortable with, or wait until such time that my schedule is clear. Thank you! Wildlife problems can occur any time - animals don't take the weekend off, and neither do we at A Wildlife Pro. Please remember that this is a private company, that we are often busy working on ladders and roofs, and can not field calls regarding dogs or cats or mere advice for do-it-yourself people. Please call only if you are want to hire our professional wildlife control services. Thanks! 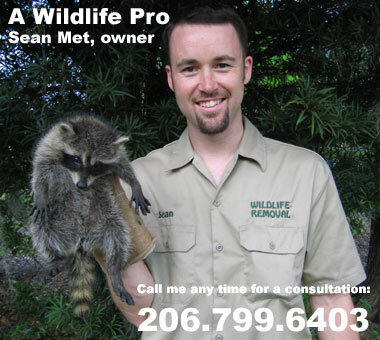 This is a professional wildlife removal company based in Seattle Washington. We provide pest control for wild animals only, not extermination of insects. If you have nuisance critters that you need to get rid of, we can humanely take care of the problem.